If you ask me if I’ve ever bought Tupperware from our Goodwill, then my answer now is “Yes, as a matter of fact, I have.” What you may not realize is that I’m not referring to the pastel colored plastic storage items we all grew up with. This week’s Thrift Treasure surprised me as well since I wasn’t aware that Tupperware had ventured into the board game industry in the mid 80’s with their own line of games under the Tuppertoys moniker. Well, maybe “their own line” is pushing it a bit – the game we picked up for a couple bucks, Bounce It In, appears to be their only issue. And like an old set of Tupperware, this one had been put away for some time and sprouted mildew from the leftover dirt and grime. 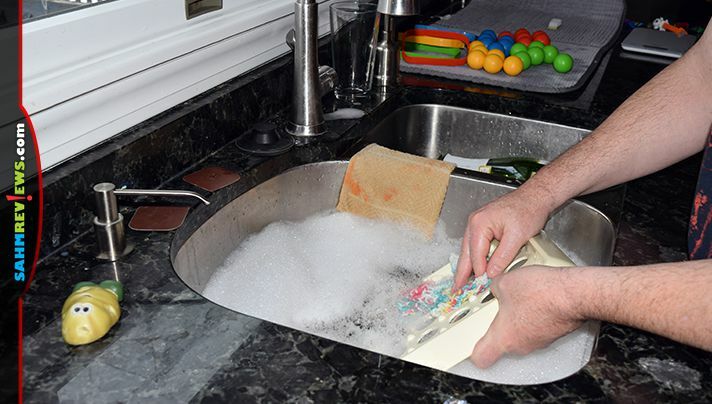 This isn’t the first time we’ve had to thoroughly wash a game before playing with it and I’m sure not the last. Sometimes it allows us to upgrade or refurbish the parts to make the game even better! Both Crossfire and Rebound benefited from some TLC in the form of cleaning, waxing and replacement parts, so hopefully this copy of Bounce It In would too! 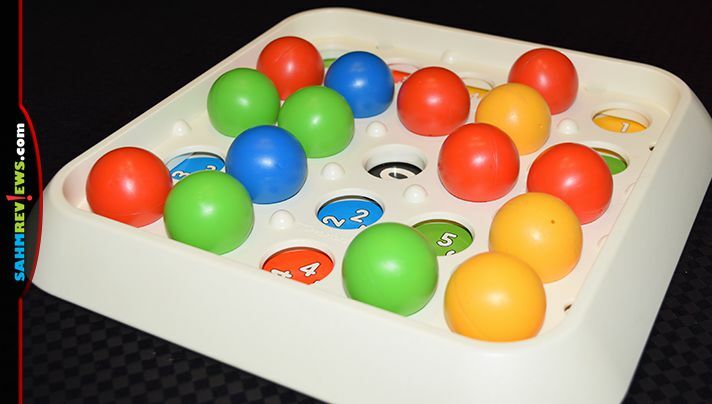 Consisting of a plastic board, 24 plastic balls, 4 plastic rings and a cardboard number sheet, this copy of Bounce It in cleaned up nicely with soap and water. The game includes rules for four different games, all utilizing the same basic play rules for taking turns. On your turn you take a ball from your ring and bounce it one time onto the play area. The ball may only bounce once before entering the play field. It must also land in one of the open spaces. 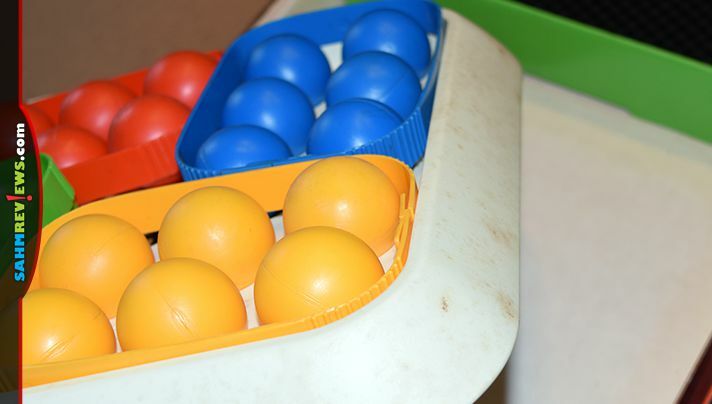 If your ball bounces more than one time (or not at all), leaves the board, lands on top of four other balls (pyramid-style) or otherwise doesn’t land correctly, it is considered a “foul ball” and is removed and given to the person on your left. That is, unless it wasn’t your color to start with – those are returned to their owner for use in a later turn. The first game has you trying to line up five in a row of any color. 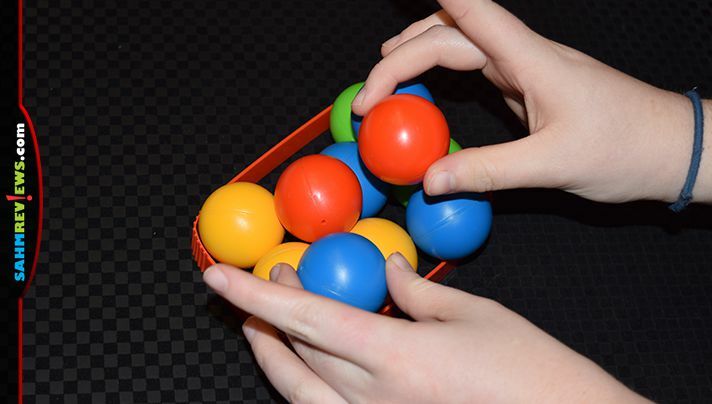 Once you complete a row, column or diagonal, remove those five balls from the board and put them in your ring. Players take turns until there is only one player left with any balls. A second version requires pen and paper to keep score. Each player bounces one ball into any open hole, aiming for the highest valued spot and/or numbers that match the color of their ball. After everyone has shot all six of their balls, scores are tallied. Receive points for the space you are on, double it if it also matches your color. Also receive a 10 point bonus if there is a line of five in a row that is made up of only your color! 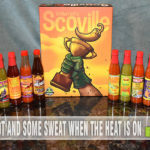 The highest score wins! 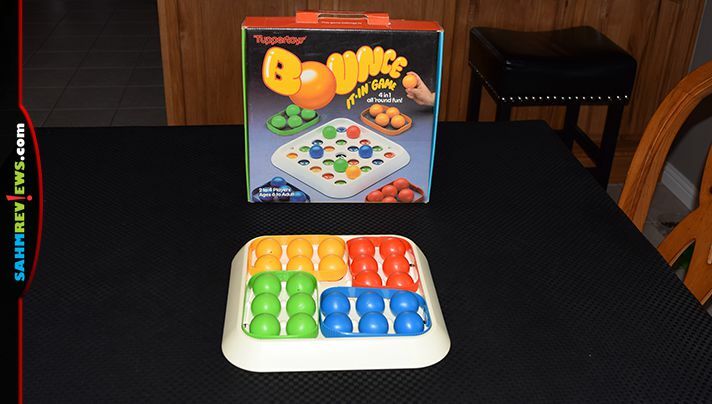 The third ruleset of Bounce It In is similar to the first except when a row is removed, you will receive the corresponding points underneath. The balls are also returned to their owner for reuse. If a ball matches the color of the space it lands on, you’ll also receive double the points! The first player to reach 66 points or more is the champion! The last game included is a little different. On their first turn a player bounces two balls, one at a time. On the second turn they will bounce as many as they like, keeping in mind their score. The goal is to get as close to 21 as possible without going over! Matching colors still double your score, so this might be a case where you don’t want to match! The player closest to a score of 21 wins. In the case of a tie, the person who used the fewest balls is the overall winner! 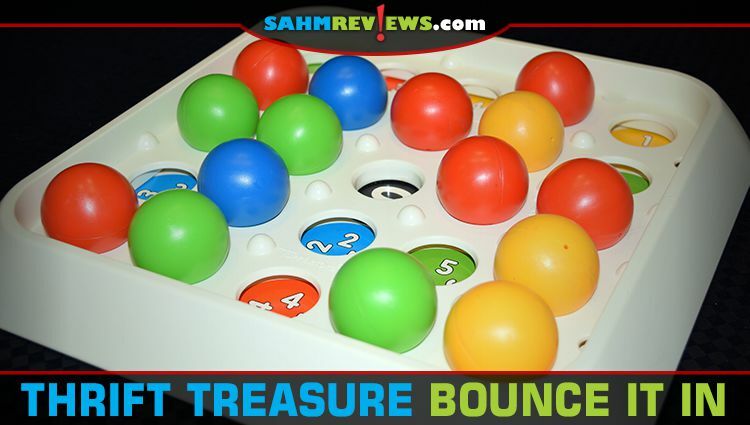 For a simple game, Bounce It In was surprisingly fun. It would be nice to see some variation in the score layout, but that’s easy enough to make at home with a color printer and a laminator. Copies do show up occasionally on eBay and we all know someone who used to sell Tupperware part time – they may be a good source for one! 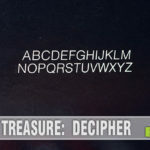 Did you know Tupperware had made a game? 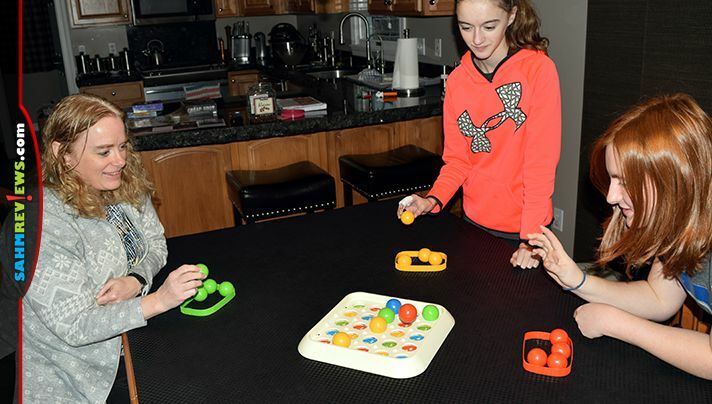 No, I did not know that Tupperware made a game…neat! That’s a great game I had no idea Tupperware made a game! Huh… interesting. Not sure it’s our kind of game. I think this would be a fun different kind of a game. My grandson would really like the challenge.